People of all ages can suffer from flat feet, however, the term “flat feet” is often misused because in actual fact, very few of us have a truly flat foot. A flat foot has no arch, meaning that the underside of the foot lies completely flat on the ground. Less than 5% of the population has flat feet that lack any sign of an arch. Having said that, approximately 70% of the Canadian population does suffer from fallen or collapsed arches, medically termed excessive pronation or over-pronation. What Does Over-Pronation Look Like? Particularly in the seated position, an over-pronating foot appears quite normal. This is because it does have an arch, or instep, under the foot. The moment weight bearing activities come into play, the situation changes. When you step down, the arches lower. When you walk, the arches collapse and the ankles roll inwards. This is over-pronation. It is important to note that pronation is not wrong and in fact, our feet need to pronate and supinate to achieve proper gait. Pronation (rolling inwards) absorbs shock and supination (rolling outwards) propels our feet forward. Over-pronation is a pronation movement that goes too deep and lasts for too long, which hinders the foot from recovering and supinating. With every step you take, excessive pronation impedes your natural walking pattern, which can cause imbalance as well as wear and tear in other parts of the body. Poor walking patterns caused by flat feet or over-pronating feet are often the source of a wide variety of complaints. Particularly as we age, poor foot alignment can cause common conditions such as heel pain and knee pain. There is a strong genetic predisposition for fallen arches. Beyond this, obesity, pregnancy and age also play contributory roles in over-pronation. The arches of the feet will also tend to lower and roll in with repetitive pounding actions on hard surfaces, especially in unsupportive footwear. 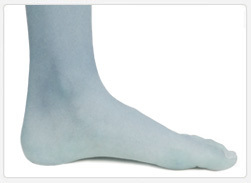 Flat or over-pronating feet are best treated with orthotics. Footlogics orthotic shoe inserts correct over-pronation, providing sustainable, long-lasting pain relief to many aches and pains in a natural way. Our most effective product for over-pronation is the Footlogics Medical Orthotic, which promotes excellent biomechanical control in the foot. These shoe inserts are made of a firm, yet giving material and feature a deep, stabilizing heel cup and strong arch support. It is wise to treat the discomfort you feel in your feet as quickly as possible so you can avoid more chronic, debilitating pain in the future.